We continue our ogeima joseki study with more tricky variations and a very surprising empty triangle for the cookie jar. This ogeima joseki is often seen. There are some difficult variations though. You have to be well prepared else you might end up being tricked! cleaning up the last few membership issues and glitches in the data,” said AGA President Andy Okun. “I hope to have the games from the US Open rated within the coming week, with the Die Hard, Self-Paired and Midnight Madness very close behind. I am grateful for everyone’s patience.” Okun said that the kinds of issues that sometimes delay ratings “…errant digits in AGA ids, getting everyone’s renewals and new memberships processed, handling overseas guests and the like…” are amplified in a tournament with more than 300 players like the US Open. Watch the EJ for news about Congress ratings. photos: right: Emory children’s group (right; bottom left to right, Edwin Lin & Ethan Zhou; top left to right, Alex Lin & Daniel Luo); left: Emory High Dan Division winners (Front row, left to right, Alex Lin & Daniel Luo; Top row left to right, Darrell Speck, 2nd Place Feijun “Frank” Luo, 1st Place Ge “Johnny” Wang, 3rd Place Huan Tan, Tony Cha). obayashi vs. Yuki Satoshi 9P (1-3). Kono Takes Lead in Meijin Title Match: Kono Rin has shown that he is going to give Iyama Yuta a real run for his money. After losing the opening game, Kono (left) won the next two to take the lead in the 39th Meijin best-of-seven title match. The second game was played at the Chokoro inn in Hawai Hot Spring in the town of Yurihama in Tottori Prefecture on September 18 & 19. The game featured fierce fighting from the start, with almost no fuseki. In the midst of a center fight, Iyama (B) played a move he regretted, and the game started to tilt in Kono’s favor. He cut off a large black group that couldn’t get two eyes, so Iyama resigned on move 200. Picking up your first win in a two-day game is important for your self-confidence. Perhaps that was reflected in Kono’s play in the third game, which was held in Jozankei Hot Spring, Sapporo City, Hokkaido on September 25 & 26 (the name of the venue has 14 characters in it and I have no idea how to read it). for Iyama’s chances of keeping his sextuple crown. who has played two. Recent results: (Sept. 18) Aoki Kikuyo 8P beat Chinen Kaori 4P by 3.5 points. (Sept. 24) Mukai Chiaki (B) beat Ishii Akane 2P by resig. (Sept. 25) Suzuki Ayumi 6P (B) beat Kato Keiko 6P by resig. Ichiriki Wins 39th King of the New Stars Title: Ichiriki Ryo 7P (right) has set another record, becoming, at 17 years three months, the youngest player to win the King of the New Stars title. The previous record, 17 years five months, was set by Yoda Norimoto 31 years ago. (If you are wondering about Iyama, he never won this title; he disqualified himself at the age of 16 by winning the Agon Kiriyama Cup and earning promotion to 7-dan). Ichiriki defeated Shida Tatsuya 7P 2-1. Only players under 7-dan qualify for this tournament, so this was the last chance for both players (they were promoted during the current term). Game 1 (Sept. 11). Ichiriki (B) by half a point. Game 2 (Sept. 17 ). Shida (B) by resig. Game 3 (Sept. 25). Ichiriki (B) by resig. The most anticipated go event in decades concluded on September 28, when Lee Sedol 9p (right) defeated Gu Li 9p in their historic jubango, winning the eighth game by 2.5 points. The 350-move game was the longest in the series, and took place in Gu Li’s hometown, Chongqing, China. 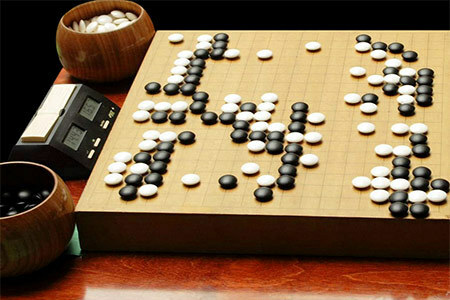 With this victory, Lee Sedol took the lion’s share of the 5,000,000 RMB prize money (more than $800,000 USD), and cemented his place in go history. The final score for the series was 6-2 in Lee’s favor, although this statistic belies how tightly fought several of the games were. As with the previous seven games, Go Game Guru will release a detailed commentary soon; in the meantime, you can find all the commentaries and videos from the match on GGG’s jubango page and click here to see An Younggil 8p’s preliminary comments on Game 8. Once completed, all eight commentaries will form the basis of a book about the match. Korea’s Jeju Island hosted the 18th China Korea Tengen from September 23 to September 26. Defending champion China’s Chen Yaoye 9p (left) has won the tournament for the past three years. With four total wins, Chen matches the accolades of Gu Li 9p and Lee Changho 9p. However, Park Junghwan 9p seemed determined to seek revenge for fellow Korean player Park Younghun 9p who was unable to stop Chen in last year’s tournament. As the only person to defeat Chen at the Tengen in the past, the pressure on Park Junghwan was high but he prevailed. Park won games one and two by resignation and restored the game record for overall wins to 9-9. The China Korea Tengen is an annual tournament where the winners of Korea’s Chunwon and China’s Tianyuan play a best of three match. For more information about this year’s Tengen including photos and game records, please visit Go Game Guru. Rom ania: The 5th Radu Baciu Grand Prix — stage 6 Sibiu finished on September 14 with Adrian Nedan 1k in first, Alexandru Acsinte 4k in second, and Sorin Padurariu 3k in third. Russia: Igor Nemlij 5d bested Andrej Kulkov 6d at the Russian Championship Semifinal in Moscow on September 21. Grigorij Fionin 5d placed third. Switzerland: Also on September 21, Sylvain Praz 1d (left) took the Veyrier-Ko Go Club 2014. Behind him were Semi Lee 3d in second and Sebastien Ott 2d in third.